Happy Dominion Day to everyone in Canada! July 1st, 2016 marks the 149th birthday for the Dominion of Canada since Confederation on July 1st, 1867. 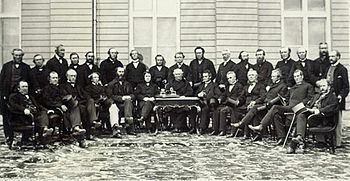 Confederation was created thanks to the hard work of many people, and helped to create the Canada we know today. So, Happy 149th Birthday, Canada! This entry was posted in General and tagged Alberta, British Columbia, British North American Act, Canadian Confederation, Confederation, Dominion Day, Dominion of Canada, Manitoba, New Brunswick, Newfoundland and Labrador, Northwest Territories, Nova Scotia, Nunavut, Ontario, PEI, Prince Edward Island, Quebec, Saskatchewan, Yukon. Bookmark the permalink.